You say: "I can't" - God says: "You can..."
"And he said, The things which are impossible with men are possible with God." Luke 18:27. "Come unto me, all ye that labor and are heavy laden, and I will give you rest. Take my yoke upon you, and learn of me; for I am meek and lowly in heart: and ye shall find rest unto your souls. For my yoke is easy, and my burden is light." Matthew 11:28-30. "And he said unto me, My grace is sufficient for thee: for my strength is made perfect in weakness. Most gladly therefore will I rather glory in my infirmities, that the power of Christ may rest upon me." 2 Corinthians 12:9. "I will direct your steps"
"Trust in the LORD with all thine heart; and lean not unto thine own understanding. In all thy ways acknowledge him, and he shall direct thy paths." Proverbs 3:5-6. "I can do all things through Christ which strengtheneth me." Philippians 4:13. "And God is able to make all grace abound toward you; that ye, always having all sufficiency in all things, may abound to every good work:" 2 Corinthians 9:8. "It will be worth it"
"I will supply all your needs"
"But my God shall supply all your need according to his riches in glory by Christ Jesus." 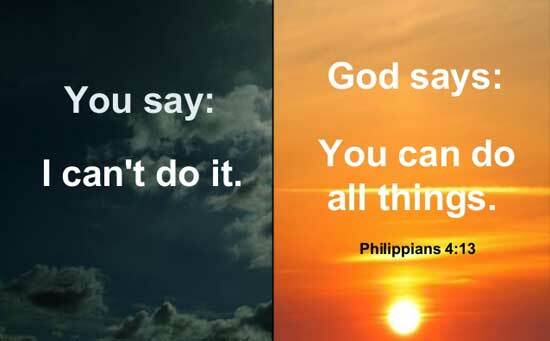 Philippians 4:19. "Cast your care on me"
"Casting all your care upon him; for he careth for you." 1 Peter 5:7. "I'm not smart enough" "I will give you wisdom"
"If any of you lack wisdom, let him ask of God, that giveth to all men liberally, and upbraideth not; and it shall be given him." James 1:5. "I feel all alone" "I will never leave you"
"Let your conversation be without covetousness; and be content with such things as ye have: for he hath said, I will never leave thee, nor forsake thee." Hebrews 13:5.